Dumpster Market makes renting a roll-off dumpster for household waste removal a simple process. All you need to do is enter your city or zip code in our search box, and you can compare rates for residential dumpsters in your area. For instance, if you were wondering, “Where can I rent dumpsters in zip code 03862?”, you would simply enter that zip code in the search box. When you are preparing to place your order, there are a few guidelines to keep in mind to ensure a successful rental dumpster experience. Below you’ll find our five tips encompassing everything you need to know about renting a residential waste container. Naturally, you will want to know about your residential dumpster rental cost. Like most things, residential dumpster rental prices will vary depending on a number of factors, such as size, duration needed, location and more. When you begin the ordering process with Dumpster Market we will show you a list of price offerings from several hauling companies. These prices represent the base cost for various sizes of containers. We offer a variety of residential dumpster sizes, ranging from 6 cubic feet to 40 cubic feet. If you’re not sure what size you need we have a special Web page on our site that provides diagrams of and suggested uses and capacities for each size of our residential dumpsters for rent. Still not sure? Contact us via instant chat, our toll-free telephone number or our online question form. The experts on our staff will help you decide which size is right for you and your project. You can also determine what size dumpster you need based on the size of your project. Remember to keep in mind that this price also includes tonnage and a set rental period. Although the displayed dumpster prices include tonnage, you will be charged an additional fee if your waste exceeds this weight limit. There will be an overloading charge for each extra ton of debris in the dumpster. Our representatives can help you find a dumpster size that can accommodate the size and weight of your waste to help avoid additional fees. Be aware of how long you need the rental as you compare prices from different vendors. The cost of a dumpster will vary depending on the length of your project. We understand that circumstances can change so it’s not a problem if you need your container for longer than the specified rental period. Simply edit your order online and you will be charged accordingly. You will be notified with the dimensions of your residential dumpster, or you can find this information on our sizing guide. From there we can help you decide on the best placement for your dumpster. This area needs to be accessible and clear of cars and other objects that could block the delivery of your container, such as low overhanging branches and other dangling obstructions. Hazardous and contaminated materials will not be accepted in dumpster containers. 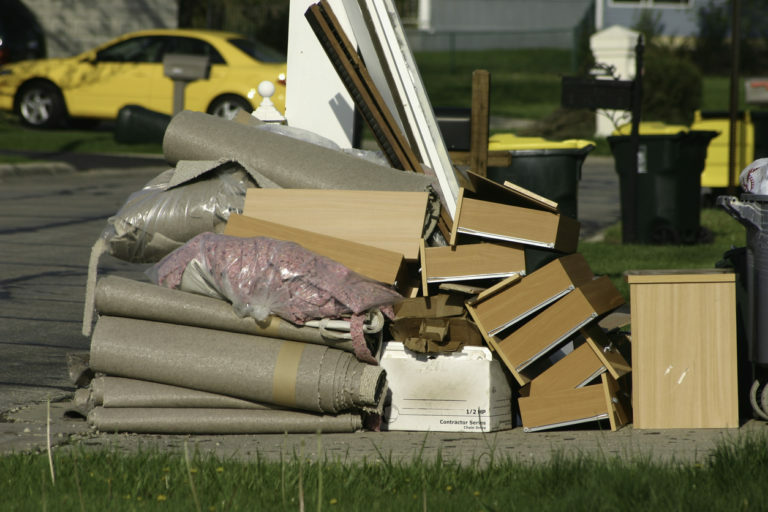 Depending on where you live, there are different regulations in place regarding where and how these materials need to be disposed of. We want to help you ensure a safe waste disposal so please familiarize yourself with what you can put in a dumpster. Following these tips will help make it easy to dispose of debris, junk and other clutter and make your project a success. If problems or questions arise, just contact our friendly staff for helpful suggestions.